Ben Glaetzer is the wild young man of winemaking: a shock-jock, rock ‘n’ rolling tearaway with 100 Parker Points to his name (the first ever perfect score for an Australian wine) and a string of fast cars, even faster women and brawling, front page headlines to his credit. Well, it would have been a nice story I suppose. The truth is that Ben Glaetzer, the hottest property in Antipodean winemaking, may well be a tender 28 years of age, but he is the model professional: passionate about his work and giving the impression that he is as shrewd and switched on as any winemaker with twice his years. I’m sure he still has his moments of youthful madness, but the lasting impression after several hours in his company was of a clearly focused, articulate, and very down to earth guy. Glaetzer is part of a wine dynasty, the family having been in the Barossa since 1888. Ben’s father, Colin, established his own winemaking operation in 1995 after 30 years amongst the elite of Australian winemaking. One highlight from Glaetzer senior’s career was his creation of the E&E Black Pepper Shiraz, which he made until 1994, and which has become one of Australia’s icon wines. Ben Glaetzer (whose wife and two brothers are also winemakers) graduated from the famous Roseworthy college after early experience working summers as a cellar-hand in Barossa Valley Estates whilst still a schoolboy. In 1998 he joined his father’s business, having gained further experience after graduation with a succession of short stints in Australian, French and Middle Eastern wineries. The family’s day-to-day business is its high volume contract winemaking operation, which crushes 10,000 tons of grapes each vintage on behalf of numerous clients. In the 2005 vintage a staggering 1,300 different wines were made in their winery from almost 30 different grape varieties. This is a training ground for a young winemaker like no other. Amongst the clients of the contract business is Glaetzer Wines, the eponymous label under which the family releases its own wines. Though there is a little Semillon available at the cellar door, the Glaetzer label concentrates on making red wines from ancient vines in the Barossa Valley, including the famed Ebenezer vineyard. For their flagship Shiraz they can draw on 80-110 year old un-grafted bush vines. Most of the vineyards are un-irrigated, though some newer vines have been planted with drip irrigation to help combat stress in drought years. In 2002 Ben set up a separate company called Heartland Wines along with a number of business partners, which he operates alongside Glaetzer Wines. 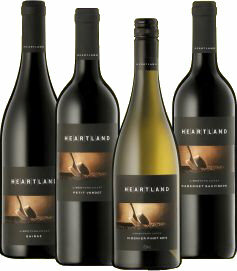 Heartland owns its own mature vineyards in the Limestone Coast and Langhorne Creek areas of South Australia, and produces three ranges: the modestly priced Stickleback, the mid-priced Coast and Creek range, and the premium level Director’s Cut Reserve. 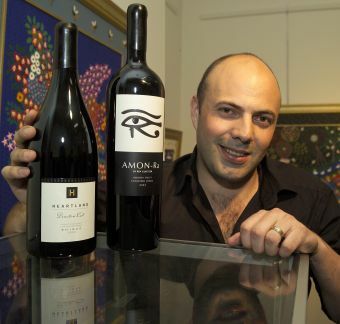 Ben Glaetzer seems to have a magic touch, with a string of awards for wines across the Glaetzer and Heartland ranges, including that 96-100 rating from Robert Parker for the 2003 vintage of AMON-Ra, Glaetzer’s premium Shiraz. “Killer stuff”, according to Robert Parker, the potential rating of a perfect 100 was enough to see American wine lovers in particular scrabbling to buy up every last bottle, and causing merchants to allocate the wine. Given the size of the contract wine operation that the Glaetzer’s run, ramping up production without compromising quality is possible, but Ben Glaetzer seems in no great rush to have his wines on every supermarket’s shelves. A contract winemaker who turns out 1,000 different wines per year for numerous satisfied clients is no “flying by the seat of the pants” operator. Yet this juxtaposition of technology and instinct seems to sum up a winemaker who is thoroughly modern in his approach to science and business, yet who acknowledges and utilises the traditional, hands-on skills by which great wines can only be made. Ben Glaetzer’s wines offer some of the best drinking in Australia right now. At 28 years of age, that shows quite some potential. Lovely juicy, herb and nettle-spiked apple and pear fruit with suggestions of tropical character. On the palate it has huge presence, with palate-coating pineapple and peach fruit and long, clean finish. £8.95. See current stockists on wine-searcher. There’s a creamy overlay to ripe blueberry and violet notes, and chocolaty depth. On the palate this is rich and dark, with toastiness and supple tannins leading to a seamless, fruity finish. £8.95. See current stockists on wine-searcher. Creamy, coffee bean and chocolate nose with charry toast and plenty of black fruit. The palate has full, rolling, svelte black fruit with a gorgeous hint of intense, minty sweetness, but fine structure. £12.95. See current stockists on wine-searcher. Vanilla and cream over minty, eucalyptus and plum and a glossy seam of cassis. On the palate there’s a huge chocolaty richness, with plush tannins folding into a silky depth of fruit. Nice tannic structure and acidity. £15.95. See current stockists on wine-searcher. This is curranty and spicy on the nose, with a fine, mellow toastiness and smooth undertow of blackcurrant and cream. On the palate there’s a real darkness, with plum and chocolate, supple tannins, and pepper and spice in the finish. £22.95. See current stockists on wine-searcher. There’s a fantastically rich, ripe, plush sweetness of fruit on the nose, with a thick, muscular quality. Unctuous and dark on the palate, this coats the tongue with bramble, dried plum and clove notes, yet some minerality and liquoricy tannins add structure. See current stockists on wine-searcher. I’d certainly require Champagne but given that refrigeration might be an issue I’d want a finer style that can be drunk under a coconut tree at ambient temperature….1996 Cristal would suit. The upside on this choice is that the orange cellophane could double as a mini glasshouse for propagating the basil, which would be required in the answer to the next question. Dream dish to eat with it? Very simply; fresh vine-ripened tomatoes with fresh bocconcini, basil and a crisp drizzle of extra virgin Australian olive oil. For seasoning, I’d assume a sprinkling of sea salt would be easy enough to find. Wine memory to see you through? Perfect companions to be stranded with? I’d need my dog, Tage. She’s an Airedale and should be able to round up any errant, edible wildlife. What music would be on your iPod? My tastes in music waver quite markedly, so I’d want a selection of good classical such as Shostakovich and Orff (scientific studies show that plants respond to classical music so it might give the basil the edge). Some serious jazz would be required as well as a smattering of Moby, Powderfinger and Chemical Brothers.